UltraMon is a must for all of you having multiple monitors. Normally when multiple monitors are connected it sometimes becomes difficult to manage things even though there’s lots of space. For instance when you click a program’s maximize button it will usually make it take up the whole screen of only one display. In addition to this sometimes screensavers run only on the primary monitor. There are several other drawbacks but UltraMon helps to overcome all such drawbacks with ease. So what is UltraMon capable of? Window management: Quickly move windows between monitors or maximize a window to the desktop using the additional window buttons added by UltraMon. Smart Taskbar: It adds an additional taskbar for each secondary monitor, and each taskbar only shows tasks from the monitor it is on. Application positioning: You set an application’s position or use custom display settings when the application is running. The application will appear in the monitor and position you choose. Display profiles: Display profiles help you to change the settings of one or more monitors instantly with ease. You can also create a display profile that gets applied when logging in, quite useful when the computer is used by many people. Desktop wallpaper: It adds the ability to use a different picture on each monitor, or stretch a single picture across the whole desktop. Screen savers: Most screen savers only run on the primary monitor. 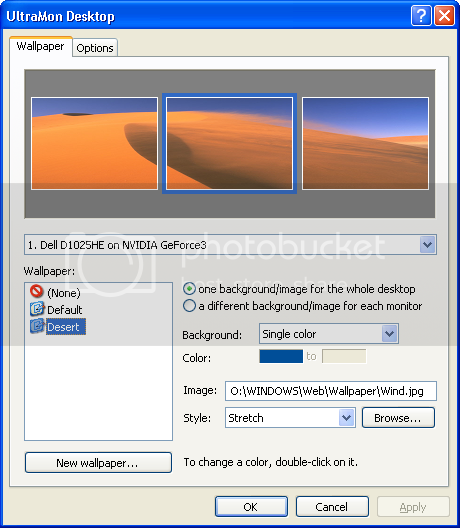 It can blank the secondary monitors when the screen saver is running, or set a different screen saver on the secondary monitor. Mirroring: Mirror the primary monitor on one or more secondary monitors. Good for presentations. Use more than 10 monitors: It provides a custom Display Settings applet with support for configuring more than 10 monitors.